As a reward for finishing in the semi-finals of Make It So, I earned the right to design my own card. The first thing I did in deciding which card to use was to look at my past. While this personnel is in an engagement, he is Integrity -2 and Cunning +2. At the time I had no concept of what attributes actually meant, so it made perfect sense to me for Riker to get up to 8 Cunning. The fact that his text activates during engagements (when personnel attributes do not matter) also shows my lack of experience at the time. To play this Interrupt, you must command three personnel and three personnel. Order – You may choose to flip any player’s dilemma pile. Remove the top card of each player’s dilemma pile from the game. By good fortune, I waited until Peak Performance was completely finalized before choosing my design-a-card. 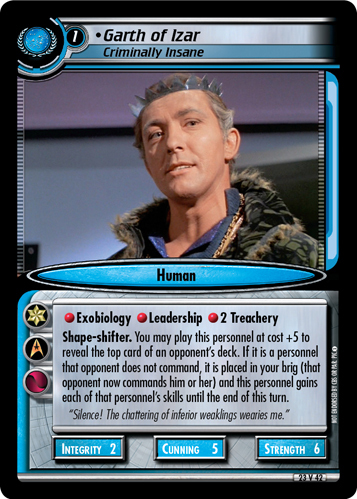 While Terok Nor needed the boost prior to that set, I felt it would be inappropriate to give that headquarters a powerful new card after they got Ruling Council. While this personnel is present with an opponent’s personnel, that opponent may not play Morph cards. While this personnel felt very thematic, I also saw no gameplay reason to hurt Morph cards. I also considered other personnel I would like to see in the game, such as a new Worf and Timicin. After much self-debate, I finally saw the answer. Although I love The Original Series, there are many episodes which I have not seen, and Whom Gods Destroy was one of them. Steve Ihnat’s performance inspired me to create Garth of Izar. I knew I wanted to capture Garth’s ability to turn into any other person. At the same time, I wanted him to keep the Original Series theme of having an “upgrade” which lasts only a single turn. To demonstrate Garth’s instability, he has an upgrade with a high cost, but also one which may yield no effect. When an opponent’s personnel falls victim to Garth’s clever plot, the insane shape-shifter locks them up and takes their form (and their skills) for the remainder of the turn. Congratulations to everyone who guessed (or deduced) the right answer for One-True-Three!